There are a lot of clever ways to revive leftovers, but one of my favorites makes a new dish that can be even better than the original. 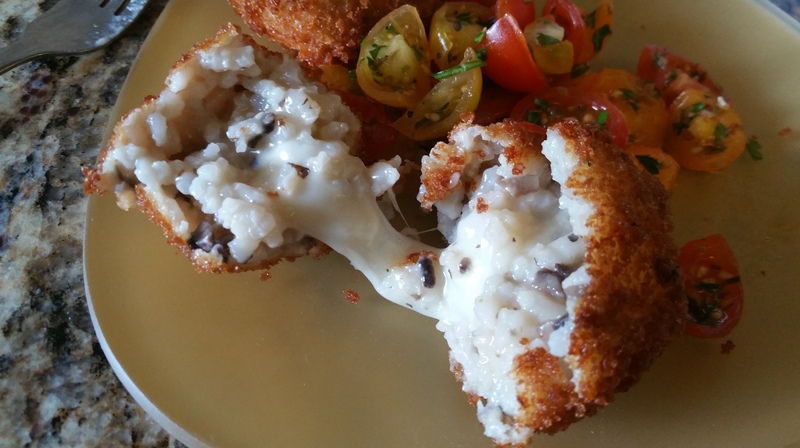 I am talking of course, about arancini, Sicily’s perfect little fried rice balls. The name translates from Italian and Sicilian to mean “little oranges” for the shape and color of the finished product. They’re said to have originated in 10th century Sicily, and later gained popularity as a food eaten on the feast of Santa Lucia. 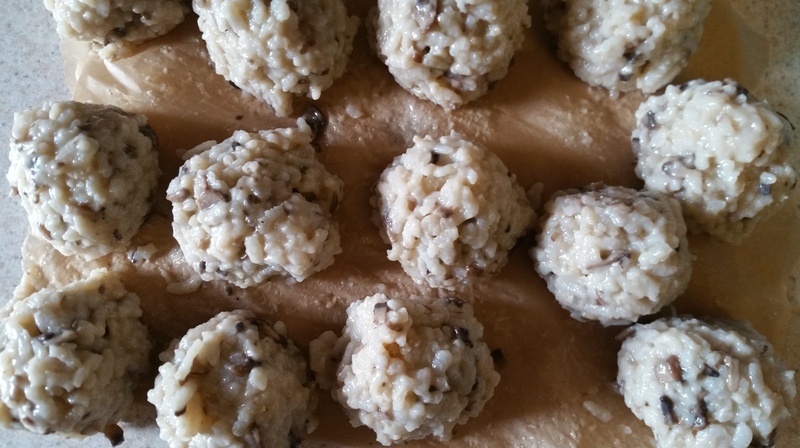 “Arancini are a traditional food for the feast of Santa Lucia on 13 December when bread and pasta are not eaten. This commemorates arrival of a grain supply ship on Santa Lucia’s day in 1646, relieving a severe famine” . Today, arancini are so popular that most food outlets in Sicily sell them year-round. Risotto already has such a wonderful depth of flavor that we don’t need to do much at all to make it something special again. 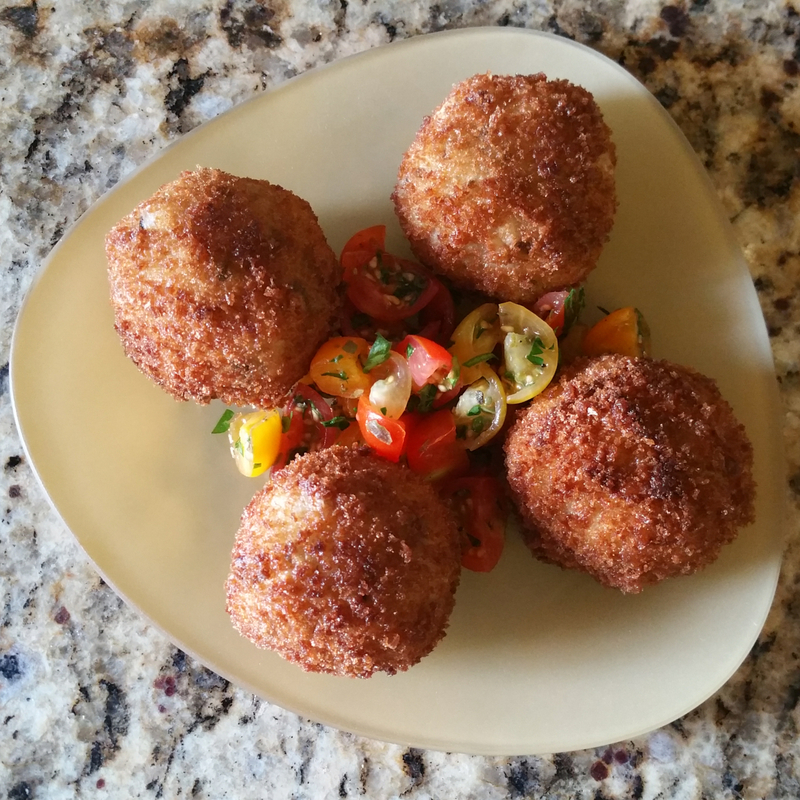 Arancini are simple to make, freeze well, and fry up in less than five minutes. Sound good? Let’s go for it. Well chilled leftovers from 1 recipe Mushroom and Romano Risotto (about 3 cups for me). You can certainly use other varieties of leftover risotto, just make sure you chill it well so that it’s firm. 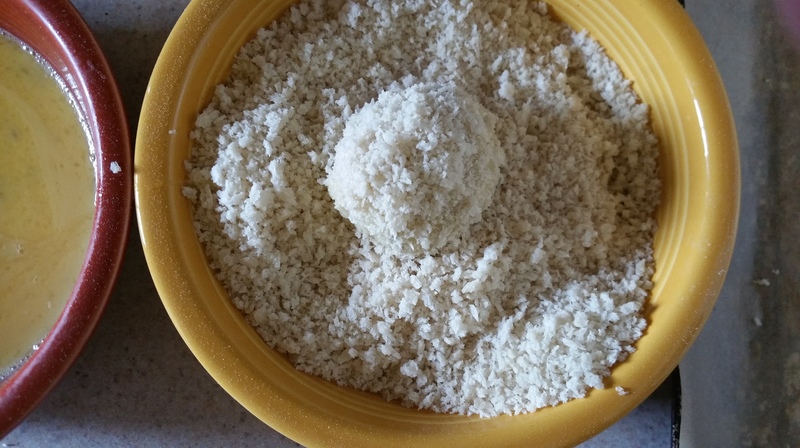 Put the flour, 2 beaten eggs, and bread crumbs into separate bowls and arrange on the counter in that order. Line a baking sheet with parchment paper. Beat one egg and mix it into the chilled risotto. Take 2 tbsp. of the risotto and flatten it gently into your palm. 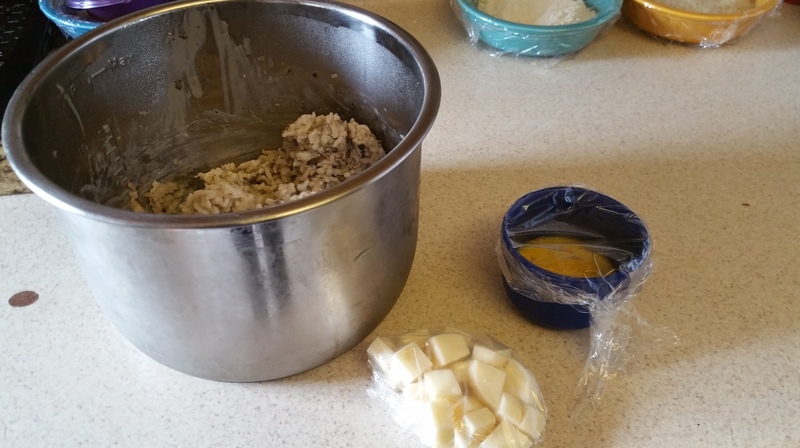 Place a cube of mozzarella in the center and then gently close your hand to surround the mozzarella with risotto. I also roll the ball between my hands a few times to get a nice compact shape. 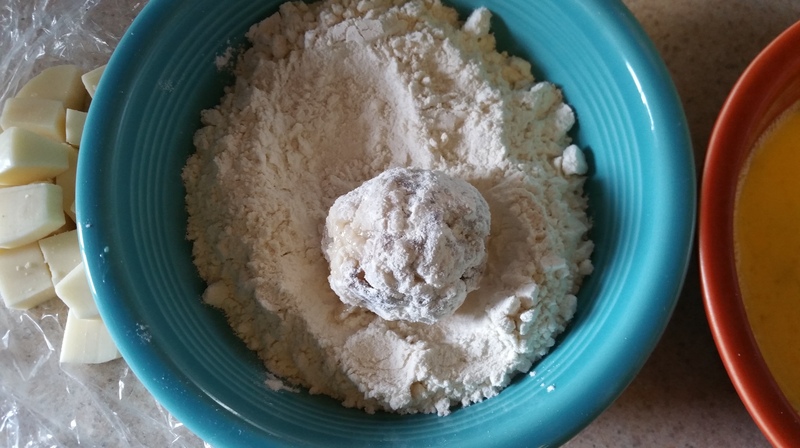 Dip the ball into the flour, shaking off excess. 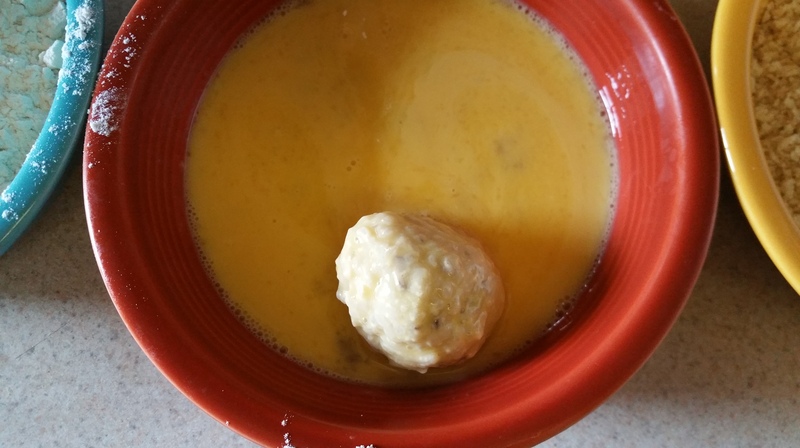 Next, dip it into the beaten egg, letting the excess drip off. 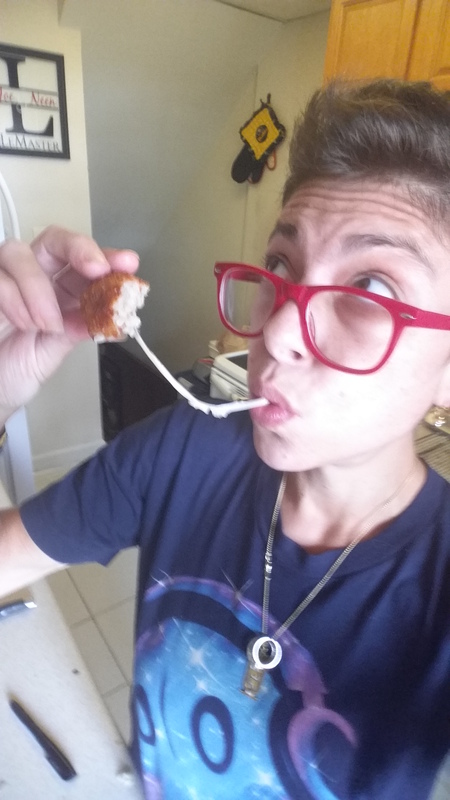 At this moment, I realized that I am one human with a somewhat small appetite and what on earth was I going to do with a dozen and a half arancini? Thankfully, these freeze well. 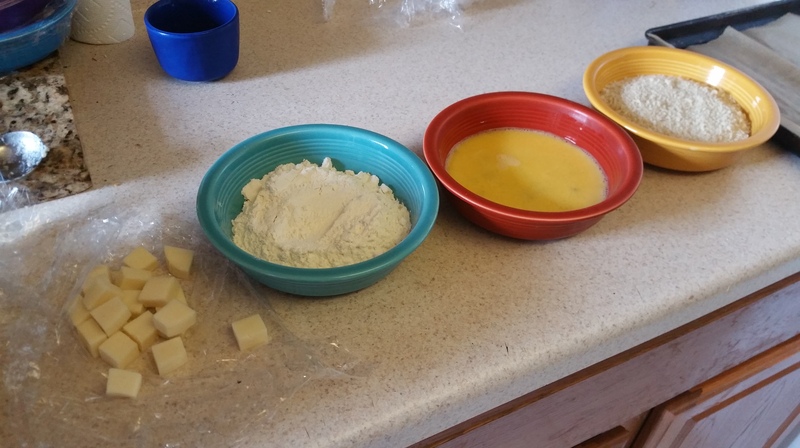 If you need to do so, freeze them on a baking sheet until firm, and then move to a freezer bag. From frozen, fry 3-4 minutes and then put in a 350 degree F oven for 5-7 minutes to get the center piping hot. Win! 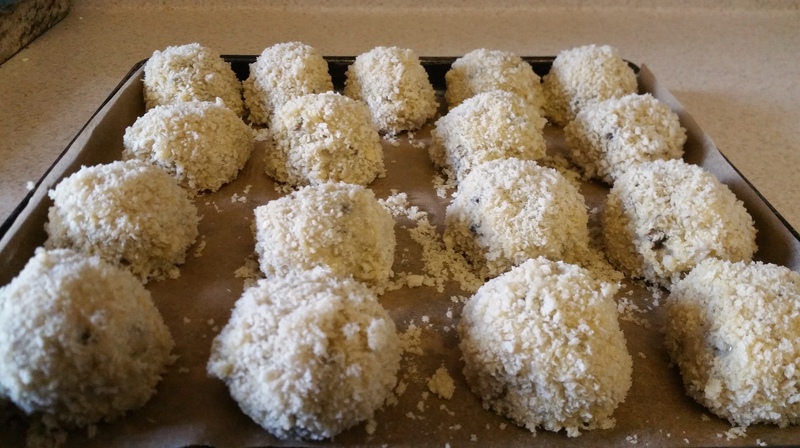 If not freezing, chill the arancini in the refrigerator for at least an hour before frying. They will hold their shape much better. Prepare to fry by filling a saucepan with at least 2 in. of neutral oil. Clip a thermometer to the side of the pot and make sure the probe is at least ½ in. into the oil. This is important because greasy fried food is not what we’re after. Use an accurate thermometer, fry at the correct temperature, and the food will only absorb a very small amount of the oil. I’ve measured on a few occasions, and it’s usually only a few tablespoons total. Bring the oil to 350 degrees F over moderate heat. You may be tempted to use high heat to get it there, but don’t. It will be harder to control the temperature later. 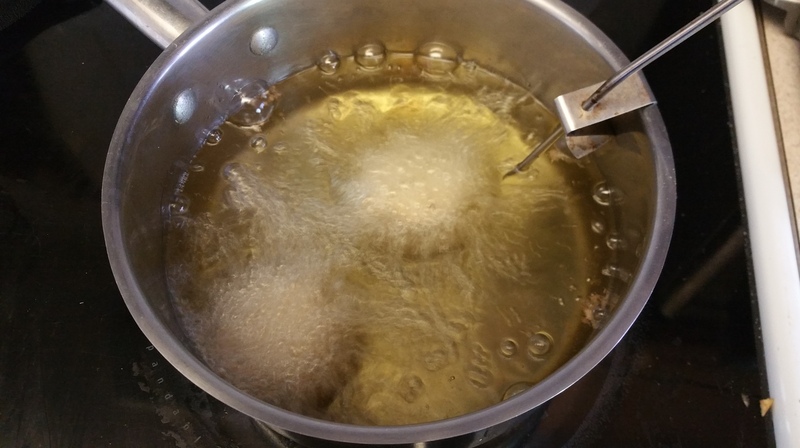 Fry the arancini 2-3 at a time to keep the oil temperature from dipping. They will cook in 2-4 minutes, depending on size. Remove when they are a deep golden brown. Bring the oil back to 350 degrees between batches. Now you get a second course of your delicious risotto with added crunchy crust and gooey mozzarella center. They’re a great appetizer or lunch alongside a simple tomato salad. Now no delicious risotto leftovers need ever go to waste. And that feels pretty great.